Do you hear that? The sirens are wailing! They could be coming from a fire truck, police car, SWAT vehicle, smoke detector or a tornado siren. But it doesn’t matter where the sound originates…all sirens indicate an emergency. Does your family have a plan to safely navigate emergencies? Tornadoes, earthquakes, wildfires, hurricanes, terrorism, etc.? 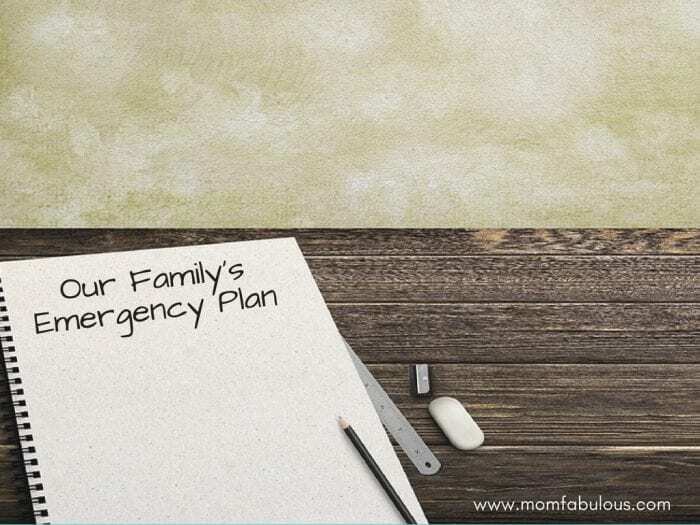 Let’s prevent future disasters (such as a toddler meltdown during a tornado, or a hungry teenager during a hurricane evacuation, or an injured spouse during a wildfire) by crafting a family emergency plan and a 72-hour emergency kit! First create a page for each type of potential emergency. Consider what type of emergencies could occur in your area of the world. See a full list of possible emergencies here, such as tornadoes, hurricanes, tsunamis, or wildfires. Next, list the designated safe space or evacuation route for each emergency. For example, a safe space during a tornado would be an interior room or the closet under the stairs. An evacuation route due to a hurricane could be taking I-75N to Chattanooga, TN. Include a secondary route in case of heavy traffic or road closures. Stash a paper map with your family emergency plan. It’s also helpful to list the name, address and phone number of family/friends or hotels in the city that you will evacuate to. Select a designated meeting spot in your town where all of your family can reconvene. What if a tornado rips through town, damaging homes, blocking roads, and disrupting electricity and telephone towers? What if you cannot get in touch with each other? Having a meeting spot will equip each person to reunite after a crisis. Suggested spots include a local school, a grocery store, a community center, a mall, or a neighborhood playground. Make sure that everyone in your family knows how to reach the designated spot, and could walk or bike there after a disaster. Specify a spot at each location, such as the east door of the school or the intersection of these two roads. Include a recent family photograph and list each person’s name, date of birth, phone number, and medical conditions or allergies. If you get separated or cannot find a member of your family, you can use this document as an identification photo for search teams. It also proves that you are related (like verifying that you are your child’s parent). Don’t forget to pack an emergency kit! 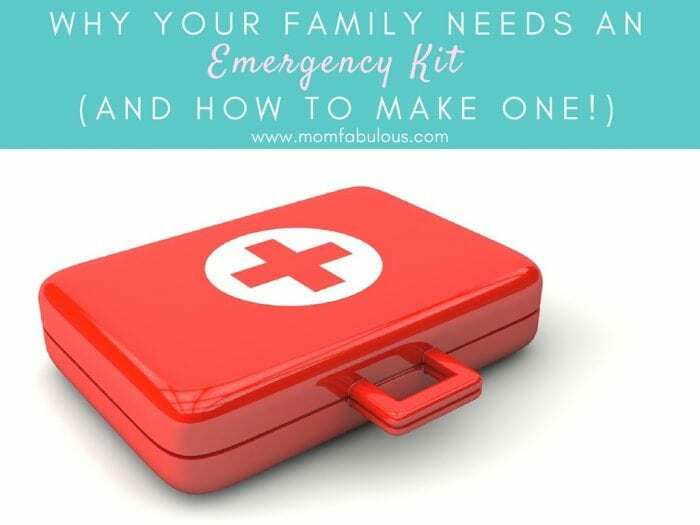 What Is A Family Emergency Kit? Your Family Emergency Plan lists important details about how to handle emergency situations, but a Family Emergency Kit will help you thrive when you put that plan into action. Emergencies are scary enough…so prepare for a potential emergency with a Family Emergency Kit. These bags typically include food, water, shelter and medical supplies for 3 days (because it usually takes no more than 72 hours for emergency crews and supplies to arrive following a disaster). 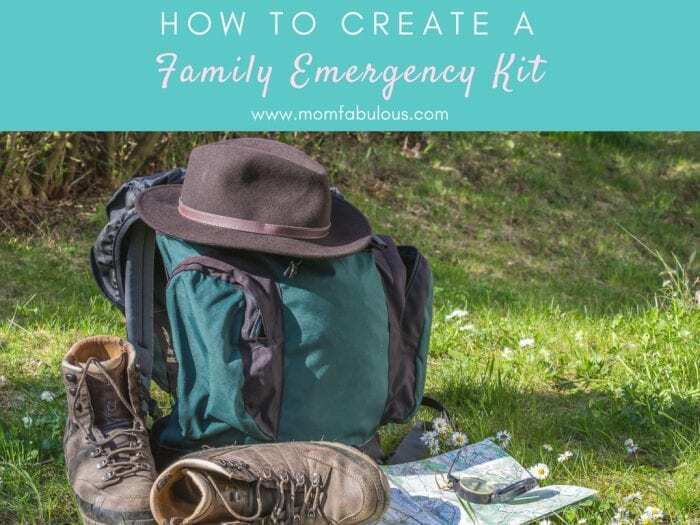 You can cater your family’s kit to the type of emergency you may experience. If your area is prone to hurricanes, you will probably want to pack food that doesn’t need to be cooked (can be eaten on the go) and rain gear inside a kit that can easily be tossed in the car. But if you live in Tornado Alley, you’ll want to have a tent, flashlights, and first aid kit. Food: Select canned, dehydrated, and packaged food that requires no preparation or very little (such as boiling). Remember that an emergency could disrupt electricity, and therefore methods of cooking. Canned beans, dehydrate or canned fruit, nutrition bars, instant oatmeal or pasta, and crackers are great options! Packing a sweet treat or candy could be a great pick-me-up during a crisis. Water: Purchase at least 1 gallon of water per person per day (1 person would require 3 gallons of water for a 72 hour emergency kit). You can buy different size bottles depending on where you store your emergency kit. Gallons, personal bottles, mini bottles, etc. Juice boxes or lemonade are a good way to keep your kids hydrated and will be a comfort during an emergency. Adults may want to include powdered gatorade packets that can be mixed into water. Shelter: Having a tent or tarp could provide your family shelter in case your home is destroyed or damaged. Don’t forget blankets, sleeping bags and emergency blankets. Tools: Not all of these are necessary, but pick the ones that will work best for your family and the type of emergencies you may face. Personal Hygiene: Bad breath and body odor will still be present after an emergency. Pack things like toothbrushes and toothpaste, combs, shampoo, soap, deodorant, and feminine products. A special blanket, stuffed animal or small toy that will entertain your child. The Dollar Store has great items such as army figurines, plastic jewelry, coloring books or small crafts. Add a 3 day supply of vitamins or medicine. Include food, water, treats and supplies for your pets. Stash your family’s kit in your safe space, vehicle, or office. Be sure that it can easily be carried among your family members or can be moved to your car. Kids of all ages can learn about potential crises. Have each child research and share a mini presentation about one type of emergency that could occur in your town. Young kids can color a picture and share one fact, while older children could make a diorama or a powerpoint presentation. Shop for items together. Allow your kids to pick out one of their favorite snacks. Pack the essentials into your emergency kit together. As you pack, teach each other how to use the materials and where everything is located in your home. See if your family members can recite everyone’s full name, date of birth, phone number and medical conditions/allergies. Pair up and see if you navigate to your safe spot from home, school, work, etc. The next time that you hear the sirens are wailing, your family will be prepared to face the emergency!